Smart speakers have been a trend in the field of home automation for a while now. As humans, we have always been fascinated by the act of a computer talking to us or responding to our voice commands and with the advent of smart speakers, the bar is set a lot higher. But what really are smart speakers? In this article we will go into more detail about smart speakers, how they work, and some recommended solutions that you can rely on. Technically, any speaker with any features beyond producing sound can be called “smart”. This includes any wireless speaker functioning via Bluetooth or NFC and can be controlled by a remote application. However, in the tech industry, a smart speaker is defined as a wireless speaker with a built-in virtual assistant that can hear specific commands from humans and perform actions based on them. Currently there are many leading companies such as Amazon, Microsoft, Samsung, Google and Apple that have incorporated their virtual assistants into speakers in a bid to provide smart speaker products. Depending on the brand, a smart speaker’s abilities can differ. Different smart speakers come with various AI technologies; Amazon Echo comes with Amazon’s own Alexa, Apple HomePod comes with Siri, and Google Home comes with Google Assistant. All speakers can be activated by speaking a hot word(s), also known as wake word(s). In Amazon Echo’s case, the default word is “Alexa” but it can be changed to “Amazon”, “Echo,” or “Computer”. It’s expected that Google’s Google Assistant could actually support customizable hot words in the future. Play a song or a playlist for you. If this makes you reminiscent of Iron Man’s JARVIS, then don’t worry, you are not alone. Smart speakers pave the way for smart homes. A family that owns a smart speaker is more likely to own other smart home products as well, as noted in research conducted by Global Web Index. Their study reveals that smart speaker owners are 47% more likely to have another smart household product in their home. On average, if you own a smart speaker, you also own two other smart home products. This goes to show exactly how a smart speaker can lead to a smarter home environment. It all makes sense too; people who already had a means to play music or book an Uber by just uttering a few words have started to think about automating more of their frequent household chores. This offers a great opportunity to manufacturers that have state-of-the-art home security systems because the demand for a reliable security system is increasing every day. One of the biggest potential risks associated with a smart speaker is privacy. As a smart speaker is listening all the time (until the power runs out), it can cause some security concerns. Even though most of the speakers only send requests back to the data centers after the hot-word (or the wake-word) has been spoken and via an encrypted channel, in the rare case where a device malfunctions, it could record more than it’s supposed to. One such incident took place when a journalist realized that a beta release of Google Home was sending data back to Google even when he hadn’t spoken the wake word. Moreover, in case a hacker finds a way to breach the device security, they can basically do whatever they want within the person’s house. If you own a smart home system and want to make sure that no one ever breaks into it, you can read this comprehensive security guide on 5 tips to avoid smart home hacking. 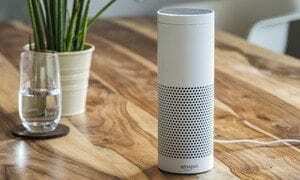 Another huge risk of having a smart speaker arises from its basic ability to listen to voice commands and respond to them. Basically, anyone who is close to the device can activate it and make it do chores. For instance, a robber can come up to the window, shout “Alexa, open the front door” and if a speaker is capable of doing that, they will go ahead and do it. That is why you should not configure your smart speaker to perform actions related to security. Other than this, if you are having a random conversation near a speaker and for some reason, the word “Alexa” pops up, then too an unwanted activation can take place. ProtectAmerica: Not many companies offer better deals than ProtectAmerica. You get 24/7 monitored home security, a price-lock guarantee and much more. Protect your home: A protect your home solution does exactly what its name signifies. It comes with home control options, monitoring center support and a 6 month ADT money back guarantee. Smart speakers finally gave us the power to talk to a computer and we can’t be more grateful to the technological world for that. As we saw in the article above, they have become the tipping point for home automation with more and more people moving towards complete home automation after falling in love with their smart speakers.